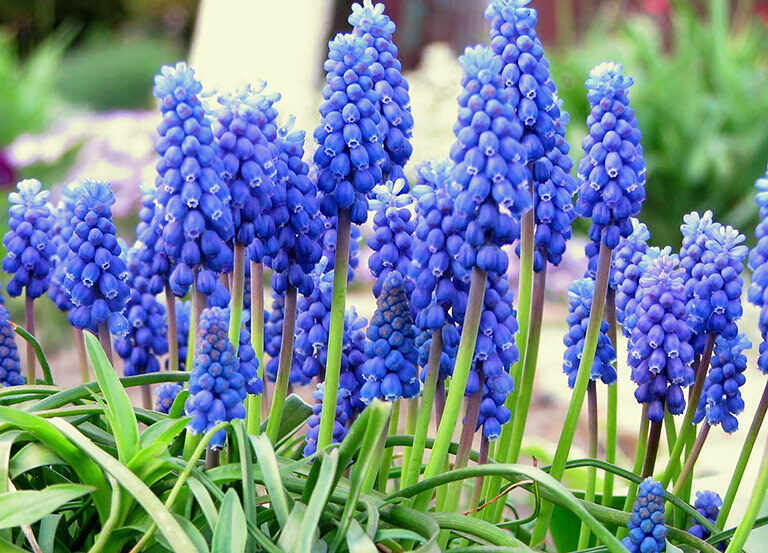 Grape Hyacinth is a popular spring flowering bulb. 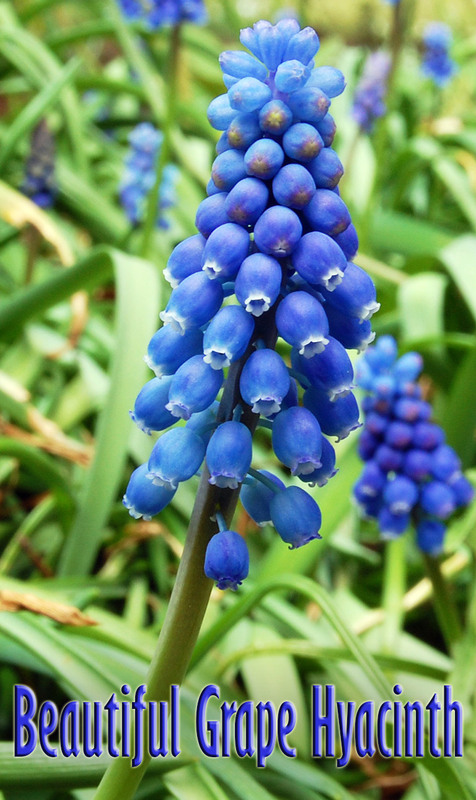 This wee little bulb, puts on a big, bold show in early spring, Commonly called Grape Hyacinth, it is a member of the Lily family. Grape Hyacinth native to central Europe and the Mediterranean, as well as central and western Asia. The bright, attractive flowers produce a light, pleasant scent. Without getting close- up, It may be hard to smell them, when planted singly. Grape Hyacinth plants grow just 6 to 8 inches tall. The spherical, spiked flowers flowers grow atop thin, blade-like green foliage. This fall planted bulb will produce foliage in the fall, that will withstand harsh winters, making it ready to bloom shortly after the snow recedes. Flower colors include several shades of blue, purple and white. Grape Hyacinth looks best grown en masse in groups of a dozen or more. They will look great, placed almost anywhere. Try growing Grape Hyacinth in rock gardens and around trees and shrubs. These plants can be invasive. Use border edging, if you want to limit their spread. Grape Hyacinth are deer resistant.The deer do not like the sweet, musky scent. Grape Hyacinth are commonly grown from bulbs. Plant bulbs in Autumn. Grape Hyacinth can also be propagated from seeds. It has a long, 6-8 week germination periods. 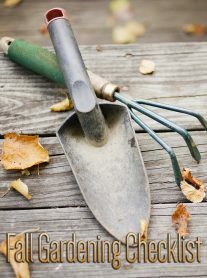 Sow seeds in late spring or early summer, covering very thinly with fine soil. Cover area with a glass or plastic. Keep the soil moist. Seed started plants will be ready to transplant in the fall. Select a location that receives full to partial sun. Muscari plants grow well in average, well draining soil. We always recommend adding compost, prior to planting. The plants should not require additional fertilizer, except in the poorest of soils. During the goring period, keep the soil moist, not dry or wet. The tiny bulbs can dry out easily. So, make sure to water them during the growing period, as needed. 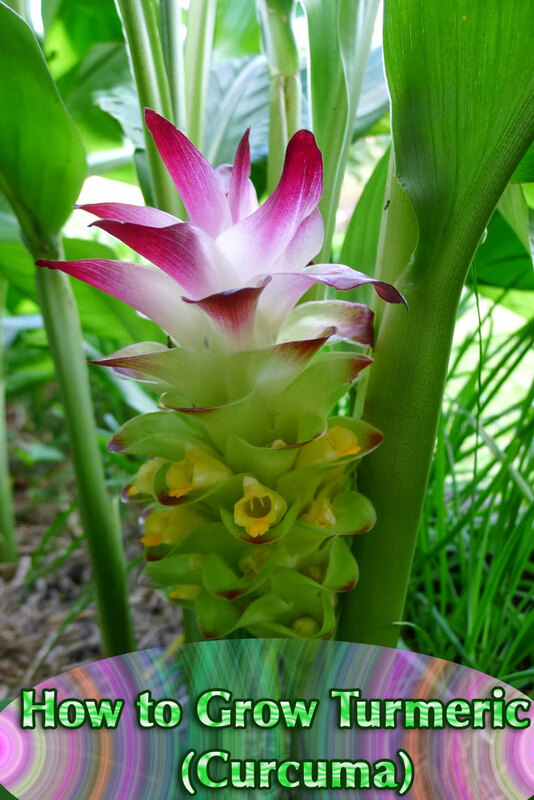 Plant new bulbs in the fall, in a location where they will not be disturbed for many years. Plant bulbs three inches deep. Space plants about 3 inches apart. The bulbs will fairly quickly produce hardy leaves, that will survive a harsh winter. Use border edging on these invasive plants, if you want to limit their spread. Following harsh winters, you may find a few dead or winter damaged leaves, which you can prune, if desired. After the flowers bloom, continue to provide water, as needed, until the plant dies back. By early summer, the plants will die back and the bulb will go dormant until fall, when it again produces a new set of leaves. Once the plant has died off, you can cut the dead leaves at ground level. Mulch around plants in the fall with compost or well rotted manure. 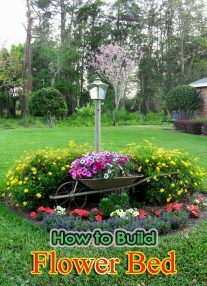 To maintain plant vigor and bigger blooms, dig up and divide every three or years. When you do, don’t forget to give some to your gardening friends! Grape Hyacinth seldom has insect or plant disease problems.